The aim of the project “Patio 13 – School for Street Children” is to offer education and to open new perspectives to street children. The main approach is the training of Colombian pre-service teacher students, who are familiar with the specific culture of street children. We use the practice of Inquiry Based Science Education (IBSE), which directly meets the interests and requirements of street children. Since 2001 more than 100 Colombian teacher students and even more street children have been participating in the project. Since 2002 we are part of a German-Colombian collaboration project called “Patio 13- school for street children”. The aim of this project is to develop ways of enabling Colombian pre-service teacher students to educate children who are used to live in the street, disconnected from the official school system and without any regular life within families. 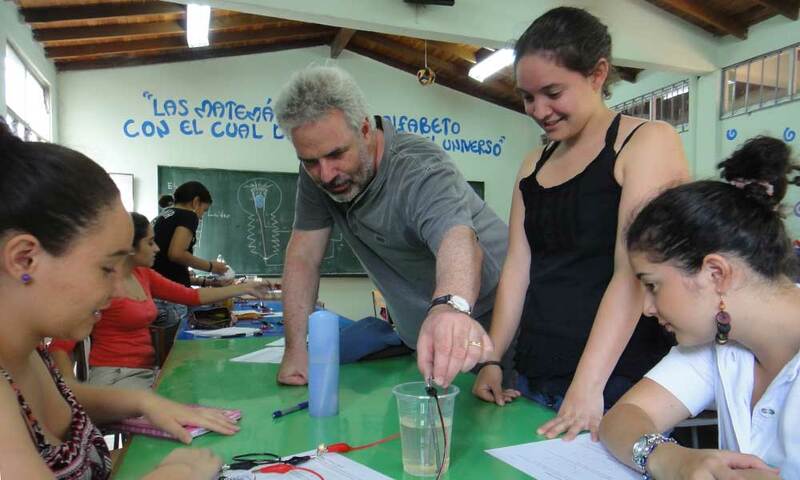 Together with pre-service teacher students in Colombia we developed, implemented and investigated different strategies using an inquiry based science education (IBSE) approach, simple experiments and material (Rocard et al. 2007). The problem we wanted to solve is: How to enable advanced teacher students in motivating street children to do science learning activities? The existence of street children is an increasing problem, worldwide (Weber & Jaramillo 2005, Strassenkinderreport 2013). According to the UN Convention on the Rights of the Child (UN 1989) the society has the responsibility to find ways in order to offer them adequate possibilities for learning – also in science. Especially in Colombia there are plenty of children living without parents, home and education. They often live in the vicinity of large cities like Medellín, Baranquilla or Cartagena. Social institutions (so called “patios”), engage in taking care of these children and offer them food, shelter and health services. But, mostly there are no educational offers. The project “Patio 13” focuses on that: For the last eleven years, a group of social and educational scientists from Colombia (Escuela Normal Superior María Auxiliadora, Universidad de Antioquia) and Germany (University of Education Heidelberg, University of Education Freiburg, Heidelberg University) has been working together in order to implement a program of instruction in different subjects to be applied in a patio in Medellín and in other institutions for children in difficult living situations (in a state of “vulnerability” (see Herrera Casilimas et al. 2012, 11ff.)). The idea is to improve the situation of those children through education. The of-fers need to be special in a way that the children are free to participate. The learning units need to be highly individualized; they have to be oriented towards the interests of street children and organized interactively. Authentic environments are necessary for an effective learning context (Roth 1995). School science needs authentic learning environments for school children with their specific experiences and social habitus (Bourdieu 1993, 98ff). Thus, street children, too, need a specific science education, which is based on their social habitus: their living conditions, experiences, motivations and interests. They do live a life fundamentally different from that of children with a family and school background (Weber & Jaramillo 2003, Herrera Casilimas et al. 2012). They behave in a specific way related to their individual street life experiences. Their capabilities with respect to teaching-learning interactions are different from those of children who experience conventional school socialization (see Herrera Casilimas et al. 2012, 67-68). Usually, pre-service teacher students are not familiar with street children’s life. They themselves typically have practiced a regular school career and, on that basis, they study at Universities in order to teach at regular schools in the future. Because of that, for being able to educate street children, the teacher students have to become familiar with street children and to adapt their pedagogy to the street childrens’ specific experiences and needs. Typically, street children are trained and specifically interested in practical, useful and exploitable things (see Herrera Casilimas et al. 2012, Strassenkinderreport 2013) and in constructing handicrafts they use to sell in the streets. These are ideal conditions for an IBSE approach. Their verbal communication skills (description, argumentation, discussion) are only poorly developed (see Herrera Casilimas et al. 2012, Strassenkinderreport 2013); on the one hand highly developed communication skills are not mandatory pre-conditions for learning science through IBSE, on the other hand, communication skills can be trained and developed while manipulating material within groups, experiencing surprising phenomena and initiating thinking about them, or working on the solvation of problems. The street children typically are not able to read and write very well (see Herrera Casilimas et al. 2012, Strassenkinderreport 2013), using IBSE the need of documenting observations and findings gets visible for them. The teacher students we are working with are only educated in theoretical approaches to science like treating formulas and calculating values. Investigating phenomena empirically is not in the focus of their science curriculum. In order to enable them to realize IBSE with street children they have to become familiar with IBSE. We are convinced that this requires that the teacher students themselves have to learn science within IBSE contexts. Co-operating with a teacher training institution in Colombia we are linking cultural aspects of education with existing experiences in education for street children and modern ways of teaching science (IBSE). Pre-service teacher students at this institution are used to study the life of street children and thus are prepared to interact with them. Twice a week, they have to offer lessons in a patio e.g. in mathematics, mother tongue, arts. In an accompanying seminar they reflect on their teaching experiences. This practice can be seen as a fulfilled pre-condition and has been continued for the project presented here: In our project, the students realized science and physics lessons with street children of a patio in Medellín and of other kids in the state of vulnerability and reflected the teaching-learning situations together with us afterwards. The major challenge for us was to enable the pre-service teacher students in applying IBSE. Neither from their own science classroom experience nor from their teacher training practices they are equipped with adequate skills. Applying Strategy 1 we started with a science course for the students. This course concen-trated on a specific content like electricity (circuits, electromagnetism) and lasted about 6 to 12 hours. Here the students could deepen their physics and methodological knowledge in an IBSE environment. On that basis and within small groups they developed their own units to be taught to street children. The ideas have been discussed internally on the basis of the pedagogical content knowledge the teacher students and we had. This phase lasted about 2 to 4 hours. The units developed by the teacher students have then been offered to street children. Each lesson taught by the teacher students has been observed carefully by fellow students and by us; additionally all lessons have been videographed. After each lesson taught the group met in order to reflect jointly the teaching and learning activities analysing the videos. Ideas for improvement where gathered and discussed. Applying Strategy 2 prior to our visit we had intense contacts via Email with our students in Colombia. When we arrived in Colombia the teacher students started immediately with the preparation of their own teaching units. This was possible in those years we could work with experienced students who already learned with us during former visits. Thus, the teacher students could apply their prior science and teaching knowledge. In addition, the teacher students could make their own choices of contents or topics they were interested in and which they liked to teach. Our task was to support them with material, methodological ideas and scientific explanations. The teaching units prepared within a course of about 6 hours then have been realized with street children of a Colombian patio. The lessons taught by the teacher students, have been observed by fellow students and by us. Again all lessons have been videographed. After each lesson the group met in order to reflect jointly the teaching and learning activities. Ideas for improvement where gathered and discussed. The group which had to teach the following lesson tried to include these ideas into their plans and practice. To plan and organize an interactive science exhibition for school children as well as for street children was the purpose of two other visits. Thus, we prepared and offered a list of possible experimental exhibits on different science phenomena. About 20 groups of teacher students could choose from this list or bring in additional ideas. Within the first days of our visit (about 4 – 8 lessons) the teacher students could try out the selected experiments, become familiar with the phenomena and arrange their own interactive exhibits. The ideas for the exhibits were presented to the whole group of teacher students and intensely discussed in order to make them a sustainable experience for the expected visitors. For a whole day the exhibition was realized in the school area inside of several classrooms and outside in the school yard. The teacher students initiated and supported science activities for about 1000 visitors including different groups of street children, which have been invited and accompanied to the school. The activities during the day of the exhibition have been observed by the teacher students and by us. Reports and photographs have been produced. The exhibition was followed by a group discussion and pedagogical reflection. How far is it possible to enable and motivate teacher students in teaching street children in science using IBSE – within a couple of weeks? How do the students realize their instructional environments for street children concerning methods and content? How do the street children react on the teaching offers in terms of participation and interest? Applying a field study strategy the data to be used for analyses are field notes. All teaching activities of the teacher students have been observed by fellow students and by us; written reflections have been initiated and gathered. The activities of students and street children have been videotaped and photographed. We recorded observations concerning the application of our strategy and the reactions of teacher students and street children at the end of each day. The data have been analysed qualitatively and mainly validated communicatively during our reflection seminars with the Colombian teacher students. According to the principles of design based research (Kelly 2006) the development of the teacher students’ skills and the street children’s motivation have been analyzed. For all strategies using the IBSE approach, the teacher students themselves have been extremely motivated in learning science topics. They have been surprised about this approach, they told us about their prior experiences and the difference between our IBSE oriented courses and the traditional science lessons at school. They enjoyed to explore material and phenomena empirically and started to pose and follow own questions concerning the phenomena they experienced. After first experiences they started to search for further information on the phenomena and explanations for their observations. They searched within their school booklets for hints and links. They discovered the usefulness of the library and the internet for gaining scientific background information. We could observe that they began to vary the experiments initiated by us, to add material and devices. On this basis the teacher students became able to motivate street children to do science activities. We could observe that the teacher students started to work on the improvement of their actions and interactions. They understood that IBSE is a good way to motivate street children. Through developing the instructional design and reflecting the teaching-learning situations the teacher students improved their own teaching practice and pedagogical content knowledge (PCK) – progresses became visible. On the side of the teacher students we could realize an engagement in scientific activities and a promising motivation to learn more within this field. 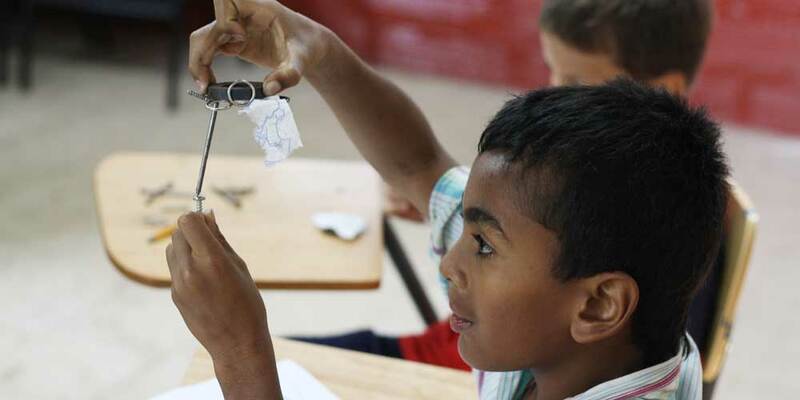 In addition, the teacher students could motivate the majority of street children to do science activities. Especially applying Strategy 1 and 2 the street children have been experimenting individually for periods of up to 30-60 minutes. While engaging in the given topics the street children used the material extensively and repeated experiments several times. They have been surprised about visible effects and phenomena, and showed to be proud about successful actions (e.g. constructing an electromagnet or a complex electrical circuit; measuring the volume of their lungs or time using the sun light). Especially “take-away-results” like caleidoscopes, periscopes and sundials have been of high interest. The street children treated their products carefully, kept them like little treasures and took them “home”. In addition we could observe that the street children have been dedicated to “paper and pencil work” following the experimenting phases. Often, at the end of lessons, some of them asked for more offers. Applying Strategy 1, street children showed a sustaining motivation in terms of participation in science activities over a period of five weeks.